The Victory Memorial Gardens were established as a memorial to the men and women who paid the supreme sacrifice and those who served in World War One. There was a public competition for the design which was won by Thomas Kerr who was the chief landscape gardener of the Royal Botanic Gardens in Sydney. Work on the gardens started in 1928. 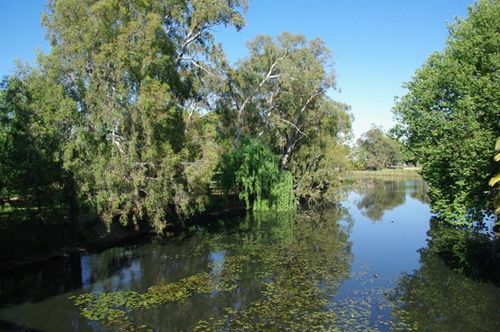 Much water has flowed under the bridge since the people of Wagga determined to lay out gardens on the bank of the Wollundry Lagoon as a memorial to the victory of the British armies in the Great War and to the Australian soldiers who participated in the titanic struggle. It has been deemed impracticable to begin the work until such time as the police buildings are removed, and the land occupied by them is dedicated to the Wagga Municipal Council for the purpose. At last it would appear that the Victory Gardens committee, in conjunction, with the Council and other interested bodies, has something fairly definite upon which to proceed. Early last month the Council was informed by the Attorney-General's Department that the question of the erection of new police buildings at Wagga, so that the land at present occupied fpr police purposes may be transferred to the Council, had been again under review. As a result the Public Works Department had intimated that plans and specifications for the new police buildings to be erected in Little Garwood and Tarcutta streets had been completed, and that the building construction and industrial undertakings branch had been asked to quote a price. If the quotation should not be satisfactory public tenders will be invited for the work. Even should there be no delay it is not expected that the new buildings will be ready for occupation until May 1928, consequently the demolition of the old buildings cannot be proceeded with until that date. It is satisfactory to have received even this quasi-assurance. The Memorial Gardens committee is now in a position to have plans prepared for laying out the gardens and for any buildings which it may determine to erect. Daily Advertiser (Wagga Wagga, NSW), 5 July 1927.